The goal of this white paper is to present a conceptual IT Portfolio management model. CIOs must adopt a portfolio management methodology and related processes that allow for the effective and efficient categorization of all IT assets (including human capital). The portfolio management process should provide sufficient analytical data to support a means for prioritising and sequencing the development and utilization of IT assets. Portfolio management should be established on a framework-based toolset that provides the decision-making analysis to balance investment risks and costs with business value. The model provides a CIO with a structured dynamic view of an IT organization, by linking together its resources, assets, and processes. Various IT solutions that offer portfolio management services tend to either cater to individual aspects of portfolio management, such as project and resource management, or blend them all together into a single reporting system. The problem that the proposed model is trying to solve is providing a convenient and resourceful representation of how all of the components of an IT organization interact and affect each other, rather than providing numerical data. The proposed model works in conjunction with traditional portfolio management techniques, but on a different, higher, level. Rather than being a part of the conventional approach, the model is a non-intrusive consumer and aggregator of its products. 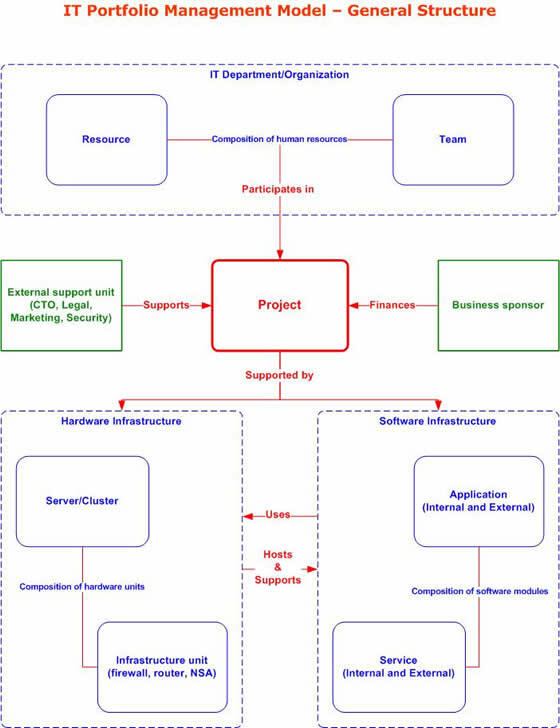 The model acts as an umbrella under which the resources and processes are assembled into a dynamic system and then analysed. The model does not discriminate against the project type, size, duration, or scale. 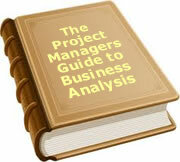 Thus, any IT effort, that can be tracked and linked to any of the other model objects, is considered a project. New development projects, maintenance efforts, investigation tasks, bug fixes, prototype development – all of these activities would be labeled as a “project” in the model, if there is a record of their existence and related resources. IT Department/Organization composed of individual employees and development teams. Being able to define organization strategy based on the record of past achievement. Inventory management is the most obvious application of the model, since the model provides access to all the resources that were available in the past and are present now. Users of the model are able to run reports on total and per/unit number of hardware units, software modules, employees, and projects. The model also allows its users to identity high-risk spots, such as critical projects that are in danger of running out of schedule or over budget, overloaded infrastructures, and repeatedly unsatisfied clients. Running historical cumulative reports on which projects and partnerships have resulted in better ROI, makes it possible for CIOs to forge strategic alliances and dynamically reallocate resources to potentially advantageous areas of IT portfolio. These, and other operations, are made available under the proposed model. Note, however, that the model does not define a concrete implementation approach. It simply offers a framework into which various systems can be plugged in. The underlying systems provide data collection, reporting and analytical tools; the model is what connects them all together. To summarize, the models gives a CIO a better understanding of how all the parts of the IT portfolio interact and an ability to draw conclusions based on quantitative and qualitative analysis of relationship between the model’s objects. The model graphical structure (Figure 1) is a snapshot outline with just two dimensions and singleton linking. In reality, the model maintains historical relationship between objects, which are linked by many-to-many connections. A complete understanding of these properties and an ability to apply them is vital to a successful usage of the model. Used individually, or in a combination, these properties make the model flexible and powerful. The properties are explained in detail and illustrated in the following sections. Relationships between objects in the model are plural. An object can be linked to one or more other objects. 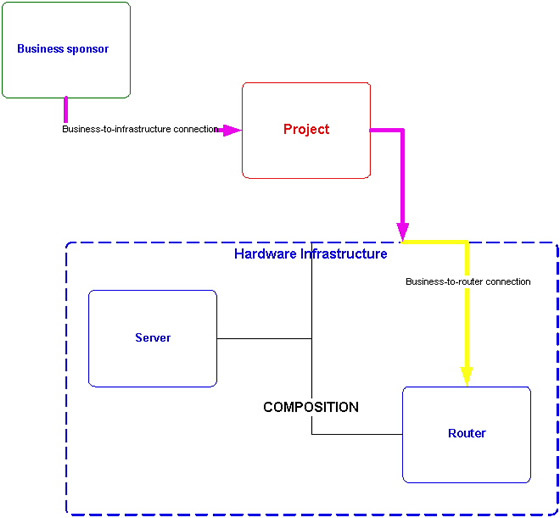 Combined with the interconnection property, the multiplicity property enables the model to link together all components of an IT portfolio. Some of the objects of the model are composite; i.e. smaller objects can be grouped into larger objects. Objects of the model could connect to either (outer or inner) level of a composite object, based what kind of output is expected from the model. Servers and firewalls could be combined into a single hardware infrastructure, while services and applications could be combined into a software infrastructure. 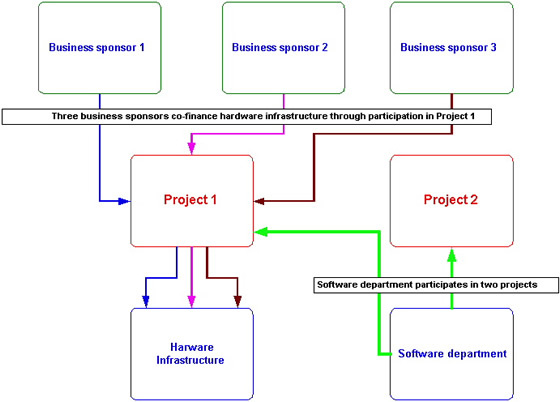 A project, or another object through a project, could then link to either an infrastructure, or any of its components. The historical relationships between the model objects are tracked through the history of closed or ongoing projects. A list projects, ordered by project start date and aligned along the time axis, is what advances the model into the dimension of time. Using multiplicity and interconnection properties together with the model timeline allows running cumulative reports, making observations of and monitoring of the development, and record change history of various aspects of an IT portfolio. Given below is a conceptual review of how the model can be applied to different aspects of IT portfolio management. The conventional project management disciplines – project risk management, resource (inventory) management, time and information management - are assumed the part of the underlying systems that implement the model. The model can be used to identify the most profit-generating clients - business users that financed the top ROI projects, sponsored large number of projects, and, overall, proved to be successful partners. From the history of completed and failed projects, a CIO can identify the most effective project leaders, development teams and software vendors. When a new, critical project gets in the pipeline, the CIO would be able to assign roles and responsibilities to the best and most reliable performers, based on their achievement record. One of the key benefits of the model is portfolio risk management, in which those areas of IT portfolio that pose risk to projects can be easily recognized, marked and avoided. The timeline property of the model, which is essential in risk management, also provides statistical data that helps validate and justify risk management decisions taken in the past. Inventory management is the most obvious application of the model. For each type of a resource, the model can tell how many units of that particular resource are used now and/or how many there have been in a certain period of time in the past. Multiplicity of model’s components controls granularity of the queries – total number of CPU per a hardware infrastructure, total number of people working on a family of projects, total investment into a software infrastructure and so on. Re-allocating resources to the most critical areas – if a project is in danger of getting over the planned budget or going beyond the planned end date, a CIO can use the model to find available resources, either idle or working on less-critical things, and re-assign them to the failing project. Human resources – answering such questions as “is the talent pool misused and people with right skills are not applying them to proper tasks? What percentage of a team’s time is spent idling between projects? Is there a pattern of such insufficiency?” Acting on these problems can significantly optimizer labour pool usage and increase project success rate. Improve ROI (squeezing) – locate model components that are not being leveraged in the most profitable way (an expensive piece of hardware used for a low-priority project) and improve the situation (make sure that this hardware unit is supporting critical or commercially gainful project). 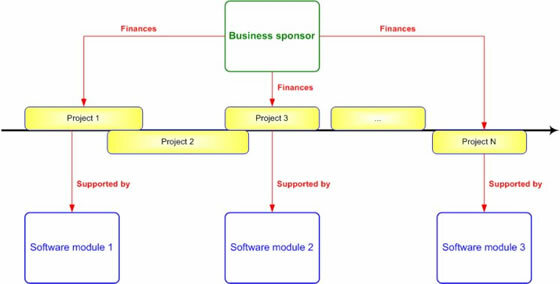 In order for the model to produce practical results, the organization must have some kind of resource monitoring system(s) in place - project management software, enterprise resource planning systems and other IT portfolio management solutions - that currently allow CIOs to run status reports and financial analysis. The model does not force any restrictions upon the kind of systems that are needed to support it, as long as there is a way to integrate and analyse results produced by those systems. However, the implementation layer should be able to attach certain attributes to the components of the model. These attributes are needed to support the linking and aggregating mechanisms of the model. One of the examples of using the attributes is linking model components by using “Project ID” attribute. 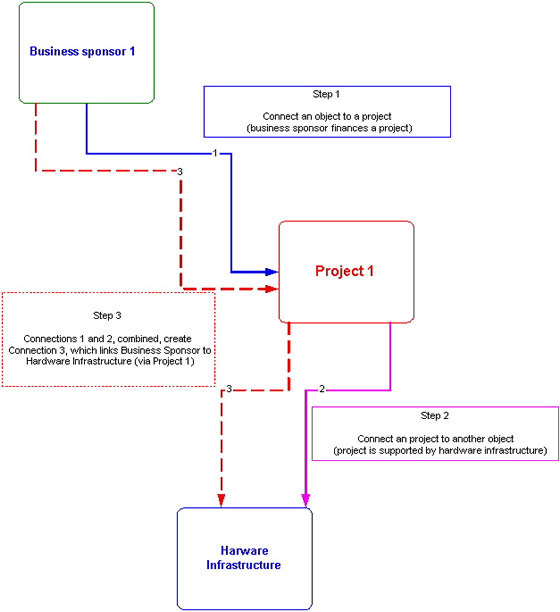 Thus, each project has a unique identifier, and other model components (resources, clients, hardware units and so on) have a list of identifiers of projects in which they have been or are currently involved. Proposing detailed implementation guideline is out of the scope of this paper. Nonetheless, below are some samples of attributes that can be assigned to an arbitrary selected set of model components. Vendor info – ranking by stability, credibility etc. META Group/Pacific Edge (2002). “IT Investment Management: Portfolio Management Lessons Learned”. META Group, Inc.
To date, 47 people have rated this article. The average rating is 3.79 - Add your rating. Just select a rating and click the button. No other information required.